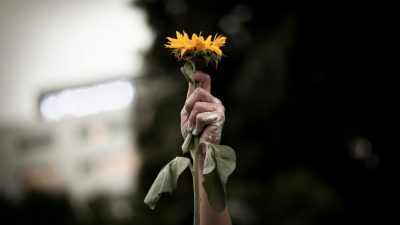 Across Barcelona and the towns and cities of Catalonia, spontaneous demonstrations are breaking out, with people chanting ‘No Pasaran’, ‘We are not afraid’ and singing anti-Francoist resistance hymns. If this feels distinctly like a scene from Spain dark past, that’s because political repression of this scale has probably not been witnessed in Catalonia since Franco. It has been a remarkable week in which the Guardia Civil (Spanish police) have seized leaflets, pamphlets and ballot papers in their million, to try to stop Catalonia’s independence referendum on 1 October. Government buildings have been forcibly entered and senior government officials arrested and charged. In some places, like Vitoria in the Basque Country, police have raided and terminated meetings addressed by Catalonian politicians. The Guardia Civil have closed down websites that provide information or commentary on the referendum, and Spanish judges have ordered mobile phone networks Vodafone and Movistar to block access to the official referendum website ref1oct.eu. The repression has even extended to the Spanish Post Office, ordered to open ‘suspicious’ mail to check if it contains referendum-related material. The political repression has been quite deliberately directed at politicians and has explicitly sought to prevent the Catalan government from functioning. The Spanish Cabinet has unilaterally taken control of the payment of Catalonia’s creditors, to prevent any expenditure relating to the organisation of the referendum. 712 town mayors have been charged with ‘assisting the referendum’ and many have been detained for questioning by the police. The Spanish government has also issued a direct threat to place Catalan premier Carles Puigdemont under arrest. 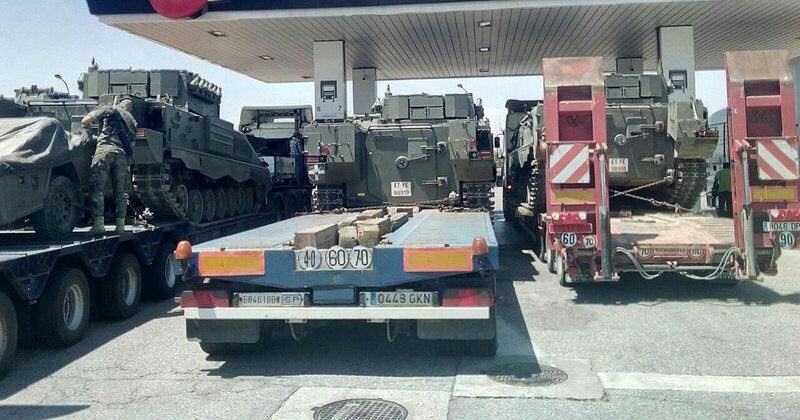 Pictures of army vehicles transporting tanks into Catalonia circulating on social media on Monday were met with a deafening silence in the international media. It is not clear precisely what the purpose of moving those tanks is, but the pictures seem to indicate a military confrontation in preparation. If the question of why this remains almost unreported remains unanswered, another question is raised by the possibility of tanks on the streets: how far is the Spanish state prepared to go to prevent the referendum? Even if it is not prepared for a fully blown military confrontation, the scale of the measures taken add up to a counter-productive political strategy. 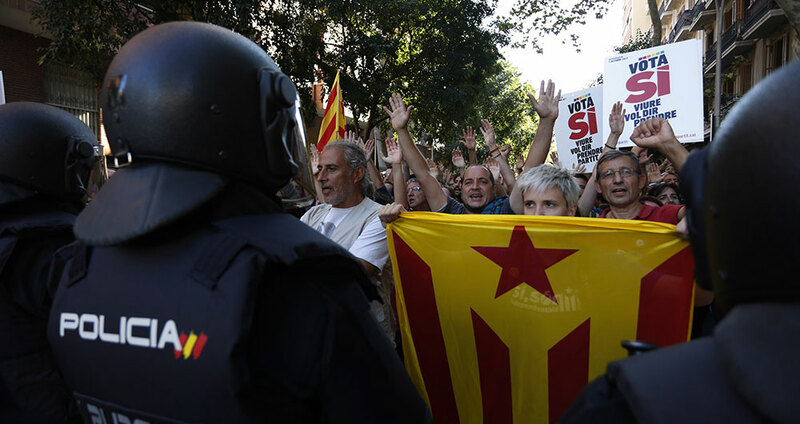 It is likely that the government miscalculated that police intervention on this scale could be used to isolate the left from the broader independence movement. After all, despite the fact that a large proportion of the ruling elite in Catalonia are nationalist, they also have a great deal to lose in any major social upheaval. By using exceptional force against the centrist government, the Spanish government calculated that it would be forced to back down, leaving the left vulnerable. In recent weeks, the left had been increasingly under pressure from the Spanish political parties, media and police. 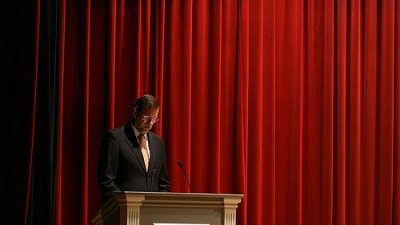 The governing party in Spain, the conservative PP, taunted the Catalonian government by accusing it of being under the influence of extremists. By this they meant the left-independent party in the regional parliament, the Popular Unity Candidacy (CUP). Invoking the traditional Spanish demagoguery about Basque ‘terrorism’, PP politician Pablo Casado warned of ‘the batasunisation of CUP and the Catalan process’. (Batasuna was a political party that was banned over alleged links to ETA.) The strategy has been to characterise the demand for a referendum in Catalonia as left extremism – and in doing so, to marginalise and demonise the left. The current repression has a parallel aim: to provoke violent confrontation with left activists. The protests have, so far, not been provoked and have been exceptionally restrained and disciplined. Whichever way we interpret this – irrational brinkmanship or a clumsy attempt to isolate the left – it has spectacularly failed. Some sections of left political and social movements were initially lukewarm about the referendum, but in the past few days, resistance to the Spanish government and the Guardia Civil has produced what looks like a very significant moment of unity. Spontaneous demonstrations this week saw 60,000 people gather in Barcelona, and around 10,000 in four other cities, to defend public spaces and demand the release of detained political prisoners. 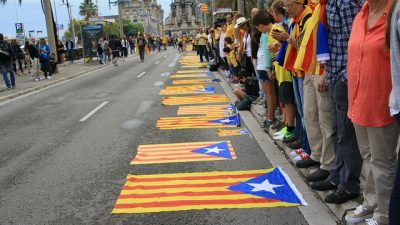 There were a total of 32 solidarity demonstrations outside Catalonia. Those demonstrations have been highly successful in reasserting popular control over public spaces and buildings. When the Guardia Civil surrounded CUP headquarters in Barcelona on Wednesday, the community response was too much for the police to deal with. Around 2,000 people arrived to protect the CUP offices and after five hours the police left the without being able to complete the raid. All over Catalonia, people taken to the streets to oppose the arrests and the other police tactics in unprecedented numbers. Workers may be ready to strike against political repression, a very rare thing in Europe indeed. When the Spanish interior ministry docked two 600-berth ferries in Barcelona and Tarragona to accommodate the extra police sent to Catalonia, the Stevedores at those docks immediately refused to assist them. As we write this piece, 50 trade unions and community organisations are meeting to build support for a general strike. A government that has set out to stop a referendum may well have inadvertently sown the seeds of something much bigger and more likely to threaten the order of power in Catalonia than a vote for independence. Ignasi Bernat and David Whyte report that Spanish central government has introduced new police powers to crack down on radical movements in Catalonia. Raphael Tsavkko Garcia recounts the wholesale government assault on civil freedoms in Catalonia, sparked by the independence campaign.